Rubber Room Ramblings: RHINESTONE JEWELS FOR HALLOWEEN! My sister "Nurse Judy" was here for a few days, and we did lots of celebrating and shopping and gardening... She was here last year after my surgery, and she was a real life safer. She was patient and kind and forgiving and drove me to all my doctor's appointments and rehab. I couldn't have made it through without her. This year we decided to make the most of our few days together and celebrate all my progress this past year by doing all the things I wasn't able to do last year. One of the things we did was decorate some pumpkins to use for decorations. This is one of the pumpkins we decorated. 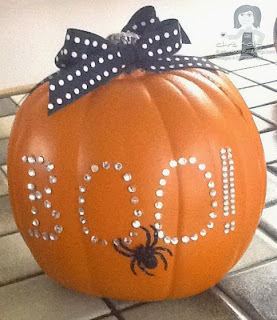 We used the Rhinestone Jewels to make the "Boo !!" It was simple, easy, and I think it turned out great. Next time, I will try coloring my Rhinestone Jewels with a black Sharpie for a different "spookier" look.